Chandler, Arizona real estate is one of the hottest commodities on the market today. One of the United States' fastest-growing areas, it is one of the most desirable locations for your new home. Commonly thought of as a bedroom community of Phoenix, Chandler is known as a residential area, with a majority of its citizens commuting to work in Phoenix and surrounding cities. Chandler is a prominent suburb of Phoenix, Arizona and it’s bordered by Tempe, Mesa, Phoenix, and the Gila River Indian Community. Dr. Alexander John Chandler, who was the first veterinary surgeon in Arizona, settled on a ranch south of Mesa in 1891. He purchased 18,000 acres of land by 1900 and started making plans for a town site on Chandler Ranch, as it was known back then. The town grew greatly from there and today Chandler is a large thriving city full of wonderful places and people. There are many historic sites in Chandler and those who love history will love this beautiful city. There are so many things to do in this great city you will never become bored! There are numerous parks, museums, an aquarium, shopping, dining, and so much more for residents to enjoy. There are many different types of homes for residents to choose from. The median home value is $248,800. The home value rate has risen by 2.3% in the past year and it’s predicted to rise by another 3.1% in the coming year. 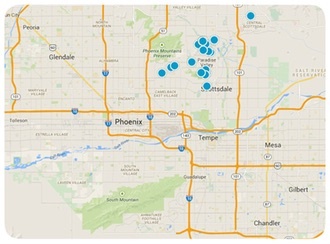 The median price per square foot is $136 and this is higher than Phoenix Metro’s median of $124. As your Chandler, Arizona real estate agents, the Russell Shaw Group has the advantage of the most extensive and current listings, giving you the edge over the many other buyers looking for a Chandler home. Search through our featured homes online, where we highlight some of the best homes and deals on the market, or do a more complete search by filling out a form to search our Online Home Finder. Still not satisfied? Search all Chandler, Arizona real estate listings in the MLS, right from our website, or contact a Russell Shaw agent directly to discuss your real estate investment opportunities. Whether you want minimal guidance or someone to walk you through the whole process of buying a new home, we have the tools and resources to give you exactly what you are looking for.